My husband’s been having cravings. Cravings for the fluffy, meaty goodness called kotletes. I, myself, am not really sure how to translate. It’s somewhat like meatloaf and then again somewhat like squished meatballs. And “meat patties” don’t sound particularly yummy. So let’s stick with kotletes, shall we? 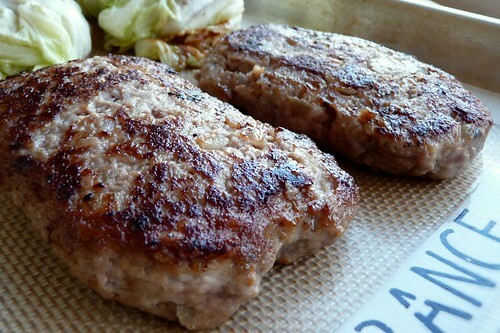 Or perhaps Mini Meatloaves, if pressed. Traditionally, these are shaped like teardrops, probably because of how the balls go squish between your palms (fun!). Soak bread in milk, reserving half a slice. Grind beef and pork in a meat grinder or food processor until coarsely ground. Saute onion and garlic with a pinch of salt until edges begin to brown. Drain bread mixture. Combine onions, garlic, and bread with meat. Grind or process again until finely ground, running the remaining slice of bread last to catch any left-behind bits. Mix spices, bread crumbs, two big pinches of salt and eggs into meat mixture until thoroughly combined. Form into 1/2″ thick, teardrop shaped patties. Dredge in breadcrumbs and set aside. In a large skillet set over medium-low heat, add 1 tbsp oil, swirling to coat. Brown kotletes nicely on both sides (about 4 minutes). Remove to a foil- or silicone-lined baking sheet, setting about 1″ apart. Bake for about 20 – 30 minutes, until done. This entry was posted in beef, dairy-free, gluten-free, latvian, untranslated. Bookmark the permalink. Greetings from Vietnam. The food here is absolutely wonderful but I would give my right arm for some Kotletes right now. You have inspired me and these are now the top of the list to cook when we get back to Australia! Did you ever eat at the main Lido in Rīga? Last night we went to the Vietnamese version in Hanoi having already sampled the fare of the same group in Saigon: Quán ăn ngon. Truly as mind boggling as the LIDO Atpūtas Centrs – and that’s saying something IMHO! I was just wondering how you were faring over there! :) The huge Lido with the windmill? Aye, I did. What an experience! The range of foods there must be at least as astonishing. Anything stick out as your favorite or a gotta-try? The most outstanding experience was however the cooking class we took through the Red Bridge Restaurant in Hoi An: http://www.visithoian.com/redbridge/ . We did the whole day class which was really worth while. We started the day by visiting an organic farm where much of our ingredients were grown. This was followed by a trip to the a local market to buy much of what we were then taught to cook. Unlike many similar classes on offer in Hoi An, this one offered real hands on experience which was invaluable. We learned to cook Phở and unexpectedly managed to produce a very acceptable version in 90 minutes (I didn’t believe it was possible in the time allocated but I was proved wrong). So an alternative answer to your question would be: the Phở we cooked at the Red Bridge! But guess what the first thing I cooked when we got back home was? Yep kotletes with sēņu mērci and boiled potatoes! Can’t beat simple Latvian fare! I have heard that about Vietnam from several people! It will take me some time to work up to going to Asia — the heat and language barriers are rather scary for me to navigate, though I would love to be able to eat at some of the stands and restaurants I’ve heard so much about. I’m amazed by how much the Red Bridge offers for the price; quite literally too good to pass up! It sounds amazing, I’m jealous! *laughs* Kotletes, just as you threatened! It may be simple, but it’s damn good, plus there’s nothing like having a supreme comfort food when you’re tired from traveling. Mmm… mushroom sauce.. That’s one I definitely need to make soon. Jā, ir! :) Bet es nezinu, vai šī ir laba recepte, jo es to neesmu mēģinājusi. Uz pannas sacep taukos sasmalcinātu sīpolu un miltus, pielej ūdeni vai buljonu, savāra, liek iekšā samaltu gaļu, karsē, līdz gaļa zaudē sārto krāsu (ilgi vārīt nedrīkst, jo gaļa kļūst cieta), piemaisa krējumu un tūliņ pasniedz galdā, klāt dodot kartupeļu biezputru un skābētu gurķi.